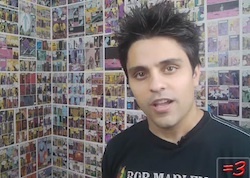 It was in the cards for months now, given the heaps of subscribers Ray William Johnson was racking up every day for his salty YouTube clips show. But now it’s official, with the latest numbers out his 3,928,218 subscribers surpasses Ryan Higa (NigaHiga) for the top spot which Higa had held since he ousted Lucas Cruikshank (Fred) last fall. Some have called him ‘the Bob Saget of YouTube’, serving up self-deprecating commentary while highlighting the latest prat falls and oddities found in the bowels of amateur YouTube videos—though maybe they are implying the post-America’s Funniest Home Videos Bob Saget where anything’s game. His “Equals Three” channel is now three and a half years old, and is part of the 2008 generation of YouTube channels that includes the likes of fellow top-10er Shane Dawson (ShaneDawsonTV). Higa, who still is neck and neck with Johnson at an equally impressive 3,912,006 subscribers was of the 2006 vintage of channels that used to dominated the top 100. Aside from his staple of commentary on the latest virals, Johnson’s also known for about a dozen music videos like “My Balls”, “Zombie Love Song” and “The Stereotypes Song.” Another plus for Johnson, maybe now the editors over at Wikipedia will finally let his page stick around after some fierce debate over its deletion.